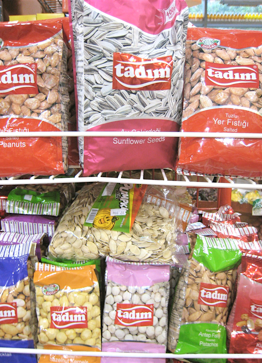 Turkish Pistachios: What is so special about them? The favorite nut of the Near East and Central Asia, the pistachio nut, has a delicate but unmistakable flavor. Its vividly green color makes it the perfect ingredient for the baklava filling and presentation. The Gaziantep pistachio is different from other pistachios in every respect. As you will appreciate, the chemical composition of the soil, the climate, the water content and other factors have a strong effect on the quality of the pistachio. According to an analysis of the chemical composition, the local Gaziantep nut has 5.5% water, 58% oil, 19% protein, 2.8% cellulose, 2.5% ash and 2.5% extract without nitrogen. This nut is also a nutritious food rich in oil and protein. Pistachio terebinthus is used as a rootstock for raising pistachio trees. The pistachio tree is resistant to extreme hot and cold, but it doesn’t like rainy and foggy weather. On the other hand, it can be raised in calcerous, rocky and stony soils in which some other fruits can not grow. 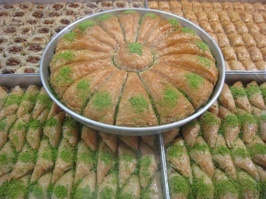 In baklava, a special type of pistachio nut called “Boz Fıstık (white speckle)” is used. This special variety is picked early, before it is ripe. Normally 300 gr. kernel can be obtained from 1 kg. of pistachios. However, if it is harvested early, only 150 gr. of kernel is obtained. Through early harvesting, a high oil ratio is achieved along with a distinctive taste of the baklava made with it. The harvest season for pistachios is usually at the end of August, early September. Families work together, along with other villagers that help out during this season. The daily harvest starts after sunrise, continues after a lunch break, until 3 to 3:30 pm in the afternoon. According to the customs of the region, the head of the family or the land owner usually sacrifices a sheep, once the harvest is complete to thank those involved and celebrate together. There is a saying in Turkish; “Is it from the soil or the water?” Pistachio nut pays its debt to the land it grows on by being the most delicious pistachio of the world. Its distinctive taste is critical as a core ingredient to the region’s world famous baklava. A folk story tells it all..
We can’t verify the historical accuracy of this folk story. 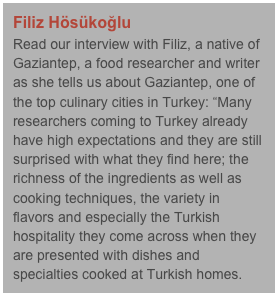 However, it does say a lot about how extensively pistachios are used in Gaziantep’s cooking. These emerald colored nuts with their distinct character appear in every dish, from appetizer to dessert, soup to kebab, giving these regional dishes a unique flavor and dimension that is difficult, if not impossible, to replicate anywhere else.